Seven months after the Civil War ended and one week before ratification of the 13th Amendment made slavery unconstitutional, two West Virginia companies of an all-black Union Army regiment gathered near Philadelphia to receive their final pay and discharge papers. “A lot of the men appear to be escaped slaves or freedmen who were living in Virginia or what was then the new state of West Virginia,” said state Archives historian Greg Carroll. The discharge formation at Camp Cadwalader ended an 18-month tour of duty that took the men of the 45th from trenches facing the Confederate capital of Richmond to the Mexican frontier. Fourteen soldiers were killed or wounded in battle, and another 50 died of disease — many of them in lonely Texas border towns, months after the war ended. The regiment was one of 170 African-American military units organized near the end of the Civil War, when the Union Army hierarchy finally recognized the value of the black fighting man — even if they were not yet ready to commission black officers to lead them in battle. Col. Ulysses Doubleday was the 45th U.S. Colored Infantry’s commanding officer. Other white officers served on Doubleday’s regimental staff or as company commanders, while all sergeants, corporals and enlisted men were African-American. “Many black people in the North wanted to join the Army back in 1861, during the first flush of patriotism, but were quickly told to forget it,” said Carroll. 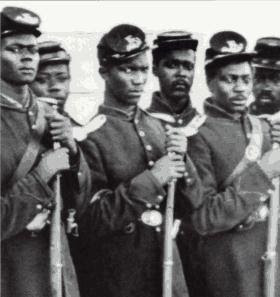 “The Army finally realized they could get another 100,000 troops by recruiting young black men, and by 1864, they really needed them.” While the federal government was finally eager to make use of black troops in combat roles, it was reluctant to pay them equally. Until June 15, 1864, when Congress passed pay equity laws, black soldiers were paid about 30 percent less than their white counterparts. The men of the 45th U.S. Colored Infantry, also known as the 45th U.S. Colored Troop, were needed even before their basic training was complete. In July 1864, four companies of the new regiment were diverted from Camp William Penn and rushed to active duty on the outskirts of Washington, D.C. Their mission was to help defend the nation’s capital against Confederate Gen. Jubal Early, who had recently invaded Maryland. The men of the 45th were assigned to a defensive position in Arlington Heights, where they served side by side with white units through the winter, waiting for an invasion that never materialized. As part of their duty, they were the only African-American unit to take part in President Abraham Lincoln’s second inaugural procession. 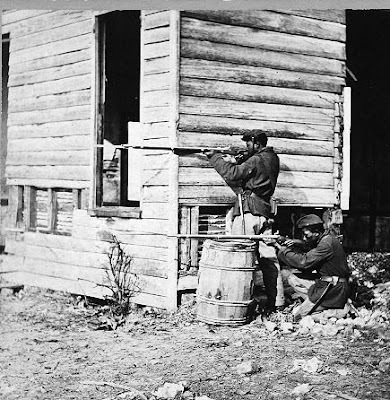 In September 1864, the regiment’s six remaining companies were sent to the front lines near Petersburg, Va., and as part of an all-black division of 10,000 soldiers, crossed the James River and took part in the Union victories at the Battle of Chaffin’s Farm and the seizure of Fort Harrison. After spending the winter either in trenches facing Richmond or in the defensive perimeter surrounding Washington, all 10 companies of the 45th reunited in March 1865. On March 26, Gen. Ulysses S. Grant and President Lincoln reviewed the regiment as it crossed the James River as part of Grant’s Army of the Potomac. On March 30 and April 1, the regiment took part in Union victories in engagements with Confederate forces at White Oak Road, Hatchers Run and Gravelly Run, and on April 2, took part in the third and final assault on the remaining Confederate lines at Petersburg. The fighting in late March and early April left one member of the 45th dead and 11 others injured. On April 3, the regiment entered a deserted Petersburg with other victorious elements of Grant’s Army of the Potomac, but did not linger to savor the victory. They pursued Gen. Robert E. Lee and his remaining forces as they made their way toward Appomattox Court House. After helping block a possible western escape route for the beleaguered Southerners, the 45th was present at Appomattox when Lee capitulated. In May, the regiment was sent to Texas to guard the Mexican frontier in the vicinity of Edinburg. Dozens of soldiers in the unit died from disease before they were finally ordered back to Philadelphia. The year after the war ended, the state of West Virginia issued 26,000 medals to honor West Virginia troops for their service. The two West Virginia companies of the 45th Colored U.S. Infantry were among those authorized to receive the medals, but only two or three were ever collected, according to Carroll. The more than 200 medals from the two West Virginia African-American infantry companies are among about 4,000 unclaimed West Virginia Civil War service medals still being held at the Cultural Center for descendants to claim. “They are beautiful medals, made of real brass, with white and red ribbons, still in their original boxes,” said Carroll. “Each soldier has his name engraved on the edge.” Among the few descendants to claim a medal for an ancestor in the 45th Colored U.S. Infantry is William Davison of Waynesburg, Pa. Private Jeremiah Alpheus, a member of Company G, was the brother of Davison’s great-great-grandmother. Alpheus survived the war, served on the Mexican frontier afterward, and was among members of the regiment mustered out of service in Philadelphia as 1865came to an end. “<“I knew his name, because I’d already done a lot of family history research, and when I saw his name when I came across a roster for the regiment on a Web site, I thought we must be related, since there are very few people named Alpheus,” Davison said. According to Davison’s research, Alpheus and a sister were slaves owned by William Shaver in Marion County when the Civil War broke out. Despite Civil War service by more than 170,000 African-Americans, nearly one-third of whom died in the struggle, equality remained elusive for blacks in the military for generations. “Dad went through the same thing in World War II,” said Davison. “He was in an all-black unit, the 320th Antiaircraft Barrage Balloon battalion. On D-Day, they landed on Omaha Beach with the Rangers, and got shot at as they set up their Volkswagen-sized balloons, which were tethered to 2,000-foot cables, to keep German airplanes from strafing the beach. Davison said he treasures the West Virginia Civil War service medal he collected in behalf of his ancestor. “It’s a unique medal,” he said. “I plan to pass it along to my daughter.” In addition to having roots in 19th century West Virginia, Davison’s mother is a native of the state. “Whenever I cross the border into West Virginia now, I wonder who from my family might have spent time there and what their lives were like. It’s a different feeling now. It feels more like home.” Carroll said one reason so few state Civil War medals have been claimed by descendants of the men of the 45th is that “there were so few records kept for black people prior to the 1880 Census.” Also, many men in the regiment did not come from West Virginia, or return here after the war. For those wanting to determine whether an ancestor served in the all-black West Virginia unit, the State Archives and History Library has available a document titled “List of colored men mustered into the service of the United States, to the credit of the State of West Virginia, since April, 1864, assigned to the 45th Regiment U.S. Colored Troops.” The list names each soldier, his date of enlistment and discharge, and sometimes the city and county of birth. Descendants who can show documented evidence that they are related to a soldier in one of the regiment’s two West Virginia companies are entitled to file a claim for the medal issued to that man. A Web page maintained by Linda Fluharty, www.lindapages.com/45/cw-45us.htm, has more information about the 45th, and includes a list of soldiers whose names appear on the unclaimed medals.